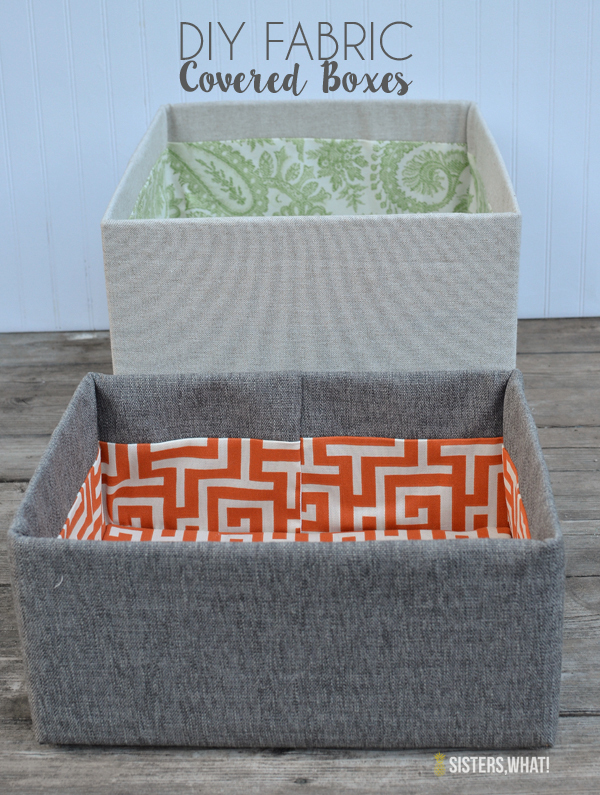 ' One Room Challenge Week 4 || DIY Fabric Covered Boxes - Sisters, What! So...I'm not sure if anyone noticed, but I was totally absent from last weeks update on the One Room Challenge. I can't really tell you what kept me busy last week, but it probably just had to do with three kids, laundry, making food, and etc... And then by the end of the day total exhaustion. But here we are at week 4. I like to say I have some updates to show you, but there has been slow progress and most of it is sanding and more sanding (were working on finishing my craft/sewing table). And my shelves are still in complete chaos. 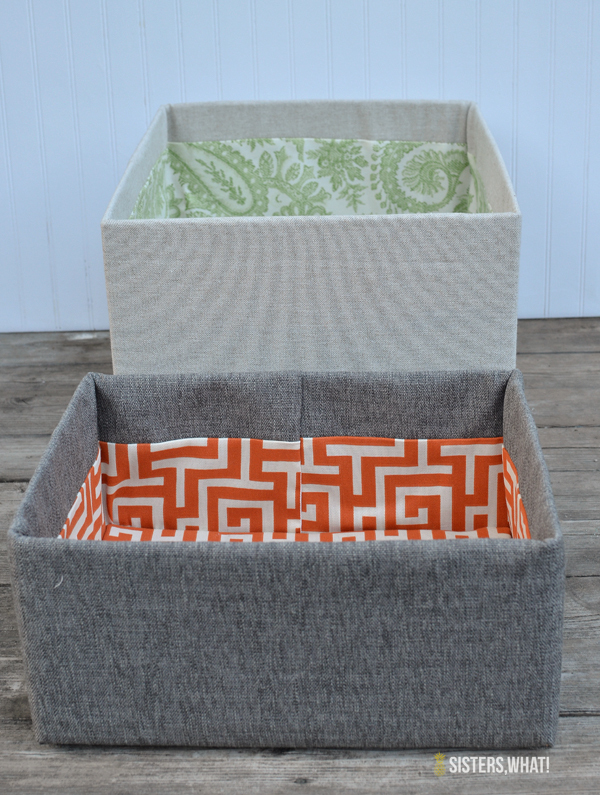 Something I can give an update on is how I made my DIY fabric covered boxes I showed you two weeks. I seriously love them and like I said, they are SO easy to make. 1 || Cut off the lids from the top of the box (save two of the long sides, we'll use them again later for the insert that goes inside the box). Tape the top edge. You could skip this step, but I thought it might soften the sharp edges of the box. 2 || Now you want to measure and cut your fabric. This will depend on the size of your box. Grab the box and outer fabric. 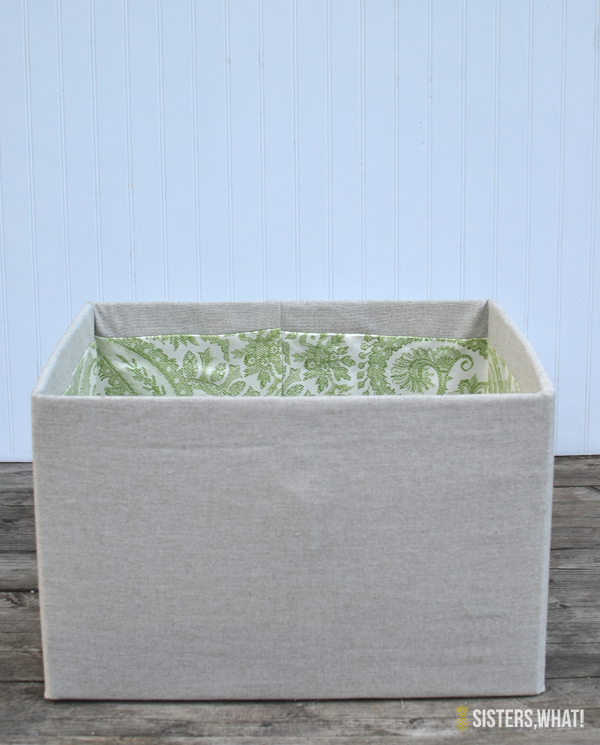 Lay the box on its side and wrap the fabric all the way around it. 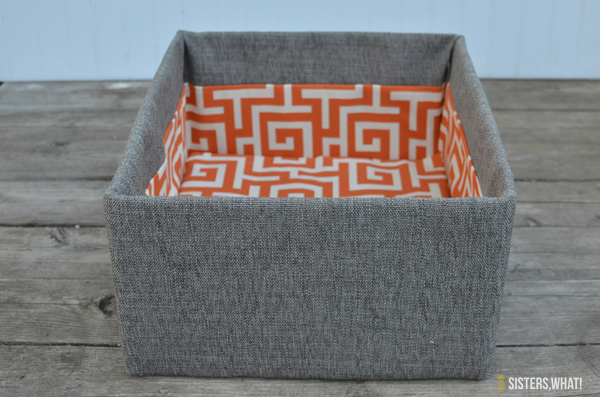 You need 2-3 inches to over lap the bottom of the box and 3-4 inches to over lap the top (unless you don't want the outside fabric to fold inside the box a few inches). 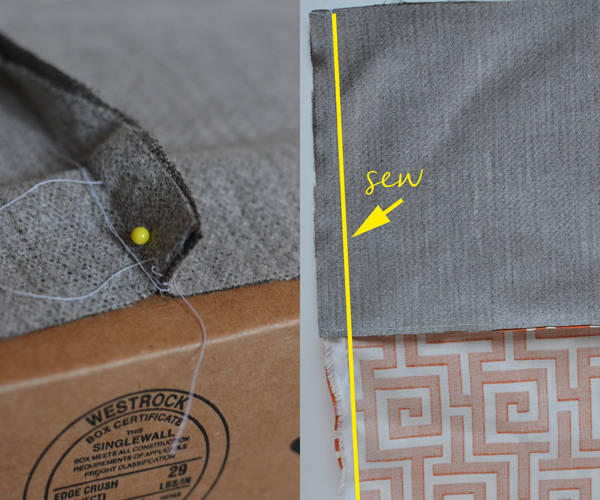 Also pin the fabric so it is tightly around the box and measure the width (I like to add on a few inches just in case. Cut accordingly. (hope that wasn't too confusing. 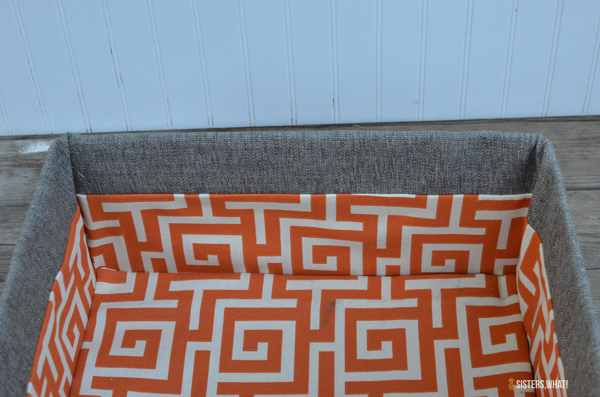 For the inside fabric, it needs to be the same width as the outside, but about 4-5 inches shorter than the outer fabric. Place it inside of the box and loosely measure it. It should cover the bottom about 2-3 inches. 3|| Once your fabric is cut, with right longs sides together of both outer and inner fabric, sew the two fabric pieces together. Then wrap the sewn pieces around the box and pull the fabric as tight as possible and pin it. Where the pins are will be your sewing guide. Now sew where your pins are all the way down to the inner fabric. You will now have a tube of fabric. 4 || after you sewn the tube, flip it right side out and pull it over the box (with the inner fabric at the top of the box so that it folds in nicely inside the box). It should be a hard squeeze to put over the box, but just slowly pull it on. 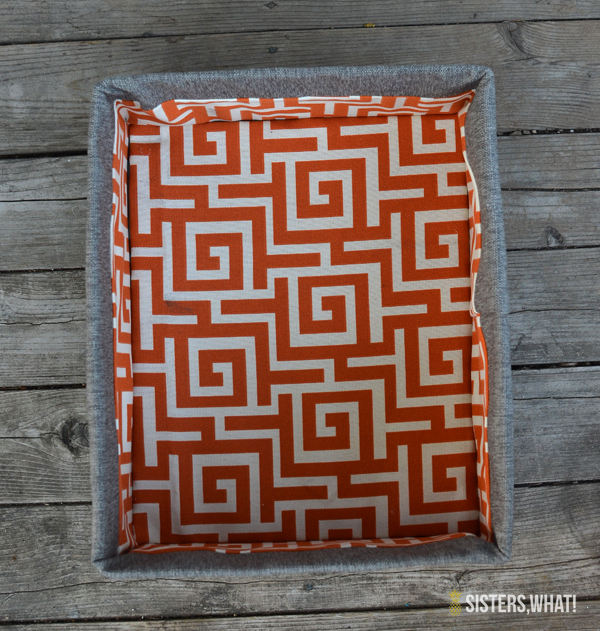 Pull it until 2-3 inches of the outer fabric folds over into the box. This will give that inside boarder appearance. You should then have 2-3 inches left at the bottom of the box. We'll glue that down in minute. 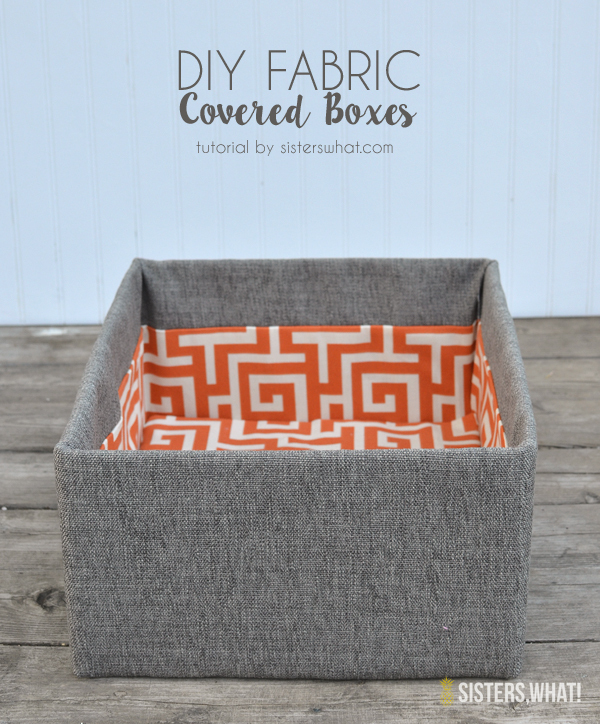 Now after you have the fabric where you want it, start hot glueing the fabric down inside the box. You don't need, much, just enough to keep in place. 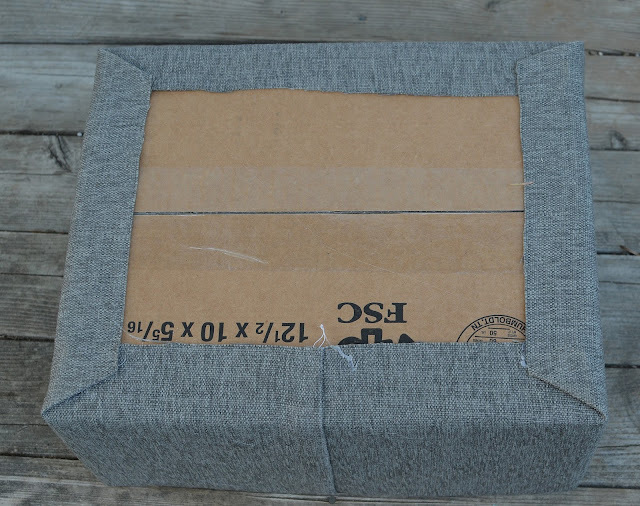 Remember, that the fabric that will be on the bottom of the box will be covered by a fabric covered cardboard bottom. After you have everything glued inside flip box over and glue the fabric down on the bottom. 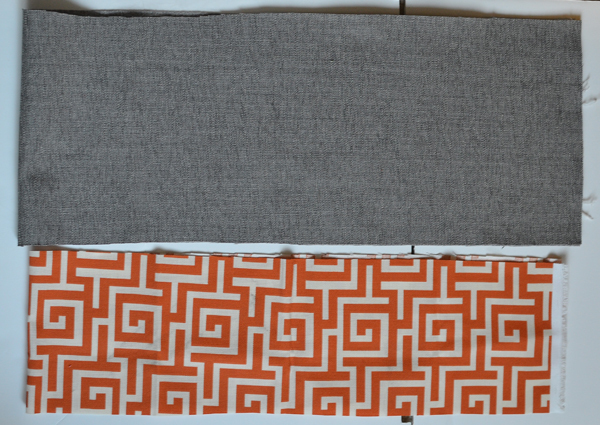 5 || now for the inside fabric insert. Take two of the lid pieces that you cut off earlier and tape them together with tape. 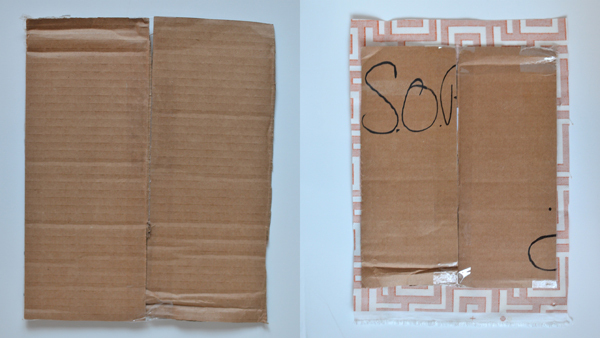 Cut your inside fabric to it is slightly larger than the cardboard pieces. 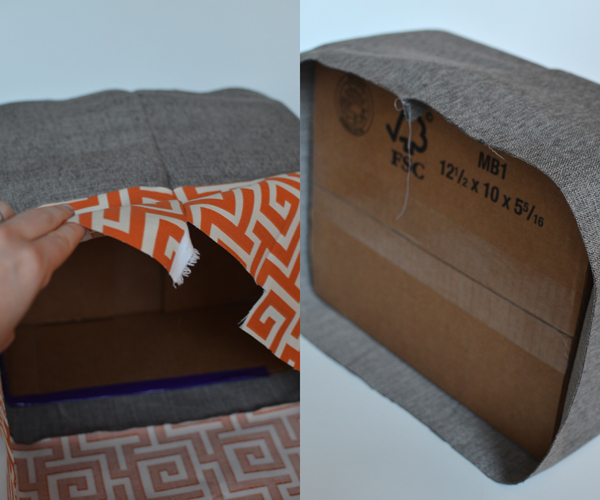 Like wrapping a present, glue the fabric around the cardboard piece. Then insert it inside the box. It will be a tight fit, but that will keep it secure in place. And that's it! Lots of steps, but really easy and quick to make. Comment if you have any questions and I'll try to answer them.